COLORADO LIGHTING, INC. provides sustainable energy solutions from consultation through installation and recycling. We enhance the efficiency of lighting and electrical systems for our customers through expert assistance in (1) specifying which products will produce the greatest energy and maintenance savings while providing the best solution to meet customer goals, (2) supplying and installing the new commercial lighting fixtures and electrical products and (3) maintaining the lighting and electrical system. Customer service is our number–one focus. We provide full–service solutions to our customers, with the key element being the long-term relationship we build and maintain. When we recommend a product or system, we stand behind that product and its performance. 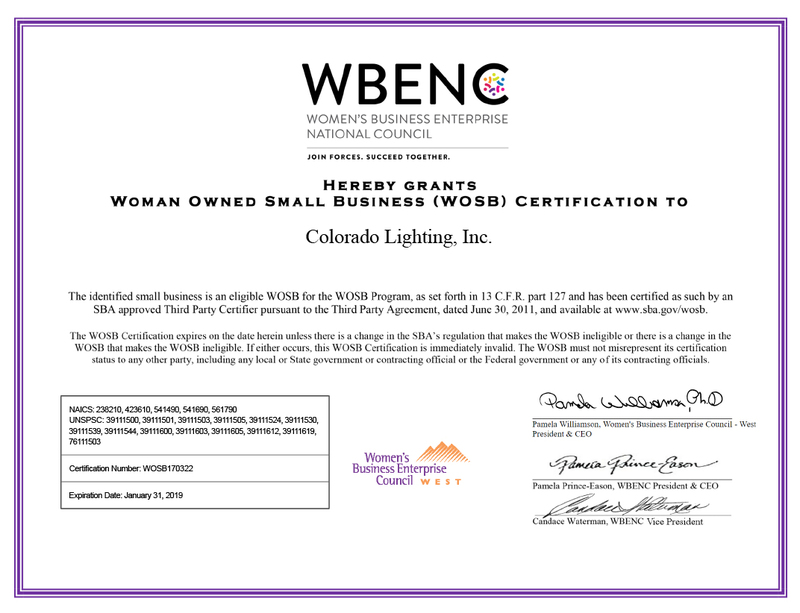 COLORADO LIGHTING, INC. was founded in 1977 and has steadily grown over the past 35 years. We have, on staff, certified lighting consultants, journeyman electricians, master electricians, and certified lighting technicians. Our employees drive fully stocked service vehicles. In addition to our service vehicles, we have fully stocked bucket trucks with the capability of reaching up to a 100 ft. working height. We also have 24-hour on-call service as well as GPS locating capabilities and Nextel 3-way radio communications. Inside and outside lighting maintenance with monthly inspection and service contracts to meet your needs. We can provide CAD layouts of a facility that detail the electrical equipment and lighting fixture locations. This information can be input into our online system, and customers can log in and access information regarding their properties. This information can also be coupled with controls and self-diagnostic systems to help reduce maintenance costs will improving lighting efficiency. Service work of any kind and specializing in Lighting Control Systems, measurement and verification, underground located, and computer wiring. Our electrical contractors can handle all of your facility needs. Sign and banner design, fabrication, and installation are just a few of our services. We also do removal, repairs, and re-branding of all types of signage and banners. Colorado Lighting is proud to be our go-to sign company in Denver. Energy audits, detailed energy analysis, financing, and rebate money from Xcel Energy. We are actively involved with the utility incentive programs and can assist companies with taking advantage of the 2005 EPACT tax incentives. We are committed to offering our customers the most updated information and services on the disposal of lamps and ballasts as well as other hazardous waste. For a personalized review of our comprehensive programs, please contact our office. Consultation and evaluation of your present lighting and/or electrical system to determine the best energy solutions for your specific needs. We have sophisticated lighting layout software to assist with the design of your lighting system. Our on-staff lighting consultants have earned CLEP, CLMC, LC and LEED-AP certifications to optimize your lighting design. We have a very comprehensive safety program, designed specifically for the industrial lighting industry. Colorado Lighting is covered with complete liability insurance. References and Key customer list available upon request.